With the Fort McMurray fire about to cross the border into Saskatchewan, the wildfire risk continues to escalate across the province. With the Fort McMurray fire about to cross into the border into Saskatchewan, the wildfire risk continues to escalate across the province. "We expect the eastern front of this fire to reach the Saskatchewan border likely today with the western winds, but it is a dynamic situation," Alberta's senior wildfire manager Chad Morrison told reporters Tuesday morning. As of 2 p.m. CST, the Saskatchewan government estimated the fire was about five kilometres from the shared border. But Saskatchewan Wildfire Management officials add it's difficult to know exaclty when this will happen. In the meantime, residents are reminded by the provincial government that there is no immediate threat to Saskatchewan communities. 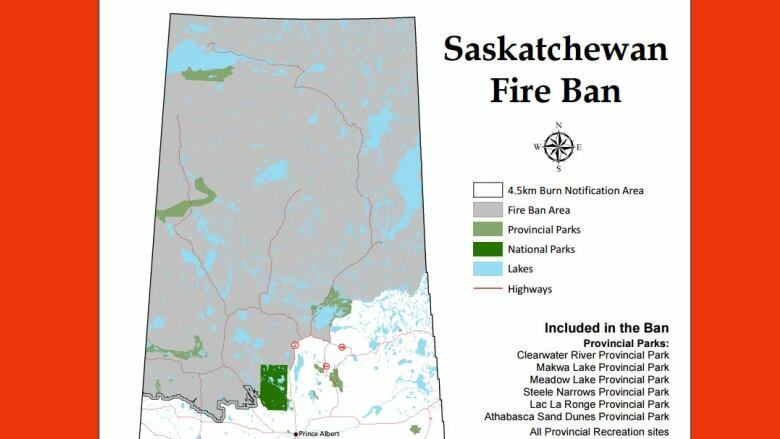 The Saskatchewan government is expanding the ban on open fires to some new areas. The original ban on open fires issued May 10 for the west side of the Crown land forest remains in place, but now it has been expanded to include Lac La Ronge Provincial Park and all Crown forest north of the Churchill River. Athabasca Sand Dunes Provincial Park. Lac La Ronge Provincial Park. There has been no significant rainfall in this entire area recently, leading to extremely dry conditions that are expected to continue, the province says. Fire bans are also in place in many municipalities in the province.